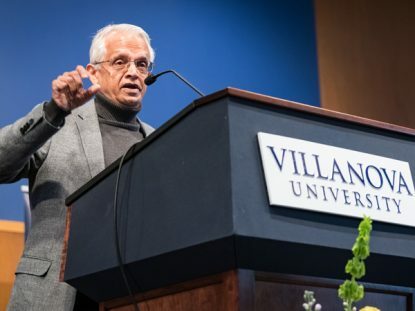 Renowned climate scientist Dr. Veerabhadran “Ram” Ramanathan, recipient of Villanova University’s 2018 Mendel Medal, speaks on climate change in his acceptance lecture Nov. 16. 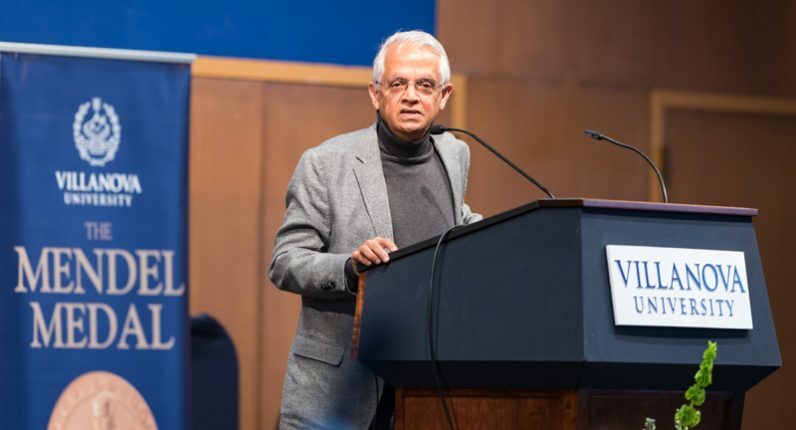 Dr. Veerabhadran “Ram” Ramanathan, an internationally renowned pioneer in climate science and climate change research and the recipient of Villanova University’s 2018 Mendel Medal, spoke to more than 600 people at the university Nov. 16 about the dangers of climate change and its impacts for the future. In his lecture titled “Climate Change: Scientific Basis and Solutions to Bend the Curve,” Ramanathan laid out compelling data to examine four basic questions: How much time do we have before climate change becomes unmanageable? How much time do we have to bend the curve and steer climate away from unmanageable levels? What are the solution sets still available to us? What can people do to contribute to the solution? First awarded in 1929, Villanova’s Mendel Medal honors 19th century Augustinian friar and scientist Gregor Johann Mendel, best known as “the father of modern genetics” for his discovery of the laws of heredity that bear his name. Ramanathan is professor of Climate and Atmospheric Sciences at the Scripps Institution of Oceanography, University of California, San Diego. In awarding him the Mendel Medal, Villanova recognizes Ramanathan’s research accomplishments including his discovery of the greenhouse effect of halocarbons, particularly chlorofluorocarbons (CFCs) previously used in aerosol products; his prediction in 1980 that global warming would be detected by the year 2000; his work with NASA’s climate satellite during the 1980s to identify and quantify how the radiation field interacts with water vapor and clouds to regulate climate change; and his ongoing scientific search for solutions to the growing consequences of global warming. Ramanathan’s recent finding that mitigation of short-lived climate pollutants will slow down global warming during this century resulted in a proposal adopted by the United Nations and 30 countries, including the United States, forming the Climate and Clean Air Coalition. The climate scientist noted that since 1750, human activity has added 2 trillion tons of carbon dioxide into the atmosphere. To put it into perspective, he said that output is equivalent to 450 billion cars circling the planet. Ramanathan has published widely in scientific journals and has led three major studies to develop comprehensive solutions to the climate change problem. Toward this end he is working with the Vatican to form an alliance between science, policy and religion to have a transformational impact on society to take actions that protect both people and nature. Speaking about global warming and the impacts of drought, storms and flooding that are becoming apparent, Ramanathan said that in the 1970s ice in the Arctic was reflecting 38 percent of the sun’s light. By the turn of the century, it had decreased to 32 percent. The Earth, he continued, is absorbing more light and heat at an unprecedented rate. If the trend continues, the world would expect to experience a 1.5 degree Celsius increase in temperatue by 2030 and a full two degree increase by 2050. Concluding his speech, Ramanathan urged the audience to take action collectively to help slow down the warming process which, if not addressed, will ultimately lead to stronger and larger hurricanes and wildfires. “Action will make a huge, huge impact,” he said. The Mendel Medal, which celebrated its 90th anniversary this year, is given to outstanding contemporary scientists in recognition of their accomplishments. Past recipients have included Nobel laureates, outstanding medical researchers, pioneers in physics, astrophysics and chemistry, and noted scientist-theologians. Climate change, which has been going on since the beginning of the earth, is now an issue for our bishops to fight for. Of course we should respect the environment, but spending resources on this make believe problem won’t help anyone or fix anything. Focus on the major issues: feeding the hungry, housing the homeless, and of course, the safety of our children. Climate change can also involve global cooling. I hear that the earth could be going through a cooling stage right now. It’s hard to keep up with all the changes. Dear Professor, I just wanted you to know that I disatgree with you that the planet is warming due to human beings. It is NOT warming we are in a cooling trend right now just as we were in the 1970’s. I think that you should be spending your time not drilling into your students that the planet is warming when it is truly cooling. Thank you for your attention to this matter. we should be more concerned with the spiritual decay in our church hierarchy than “global warming”. temperature change for the earth has been cyclical for centuries. Let’s individually be good stewards of our resources, but religiously our goal should be to do God’s will on Earth/ This BS about Global Warming is disingenuous spiritually and naive. God will Not be judging us on our efforts toward Global Warming. It is a distraction and another sign of the Abilities of the Devil to distract man. Let’s get right with God and get our own House in Order. Amen.